One finds at Oca seamless continuity and the soul in suspense, enchained by the beauty, knows not where the work of the garden architect ends or that of the farmer, intertwined as they are with one another, and both of them immersed in a nature with the most prodigious forms and colours that can be found...". With this delightful prose written to justify the application filed in 1945 to designate these historic gardens as protected property, the historian and academician, Javier Sánchez Cantón, underlined the most salient feature of this ensemble: the inseparable unity of water, stone and vegetation that makes this monument a masterpiece of architecture, engineering and garden design. 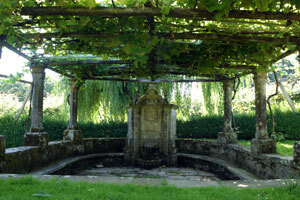 This outdoor area was originally the work yard of the country estate and continued to be used for this purpose until the third quarter of the 19th century. 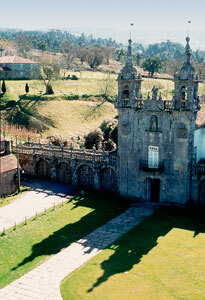 Although it no longer has this function, it preserves in extraordinarily good condition the main elements that shape, amid a rural environment, a cultivated, ordered architectural space which, with its three types of buildings (chapel, palace and single-family dwellings) expresses in stone the social relations that existed in the 18th century. The chapel that presides over and encloses the area by means of a viaduct of blind arches that link it to the palace and the garden wall is a baroque building that replaced the former hermitage built on the instructions of María de Neira in the 16th century. 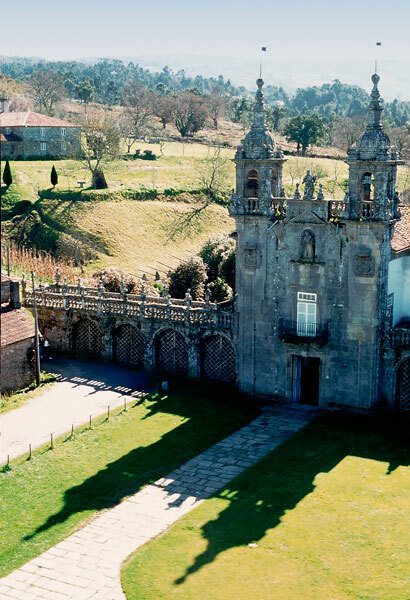 It was erected between 1731 and 1752, and possibly designed by the Dominican architect Fray Manuel de los Mártires. It has a Greek cross ground plan and is dedicated to Saint Anthony of Padua, who overlooks both the main facade and the high altarpiece. 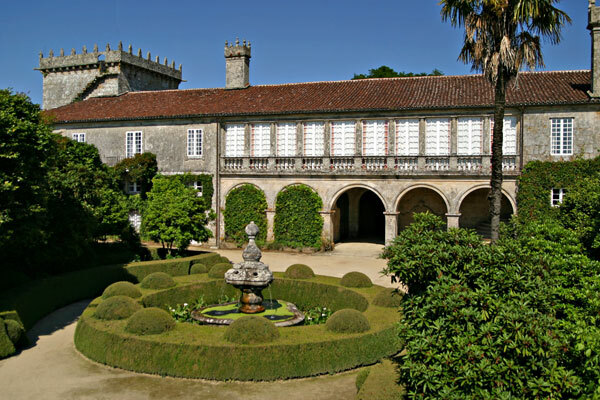 The lobby, which preserves on both sides its 16th-century doors crowned by the coats of arms of the Luaces and Neira families, respectively, leads into the courtyard, an area surrounded by constructions built in different periods, from the 16th to the 20th centuries. The current tower and the main body of the palace are the product of alterations dating from the early 18th century to the late 19th century, resulting in the transformation of the balcony-corridor into a gallery and the construction of the main staircase. On the far side of the unfinished northern corridor, a hand pointing to the direction to be followed and displaying the legend "Prosiga 1746" ("Onward 1746") suggests that a courtyard enclosed by buildings of the same height was planned in the 18th century. Of the various designs for this courtyard, the only constant feature is the three-lobed fountain in the centre. 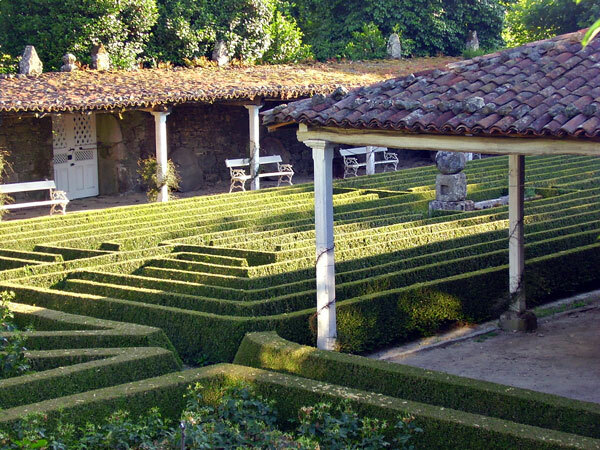 The current geometrical, formalist parterres were laid out around 1930 by the 16th Marquis of Camarasa and completed by the 20th Duke of Segorbe as part of the restoration work carried out over the past thirty-five years. From the courtyard visitors can view a rectangular building only one storey high formed by the combination of three constructions: two lean-tos and a greenhouse which, with its large south-facing panels of white glass divided by granite pillars, is probably one of the oldest known existing greenhouses in Spain. Located parallel to this building is a labyrinth of box shrubs inspired by a pattern on the paving stones of Canterbury Cathedral. Owing to their extreme fragility , the greenhouse and labyrinth can only be viewed from the courtyard for conservation reasons and are not open to the public. 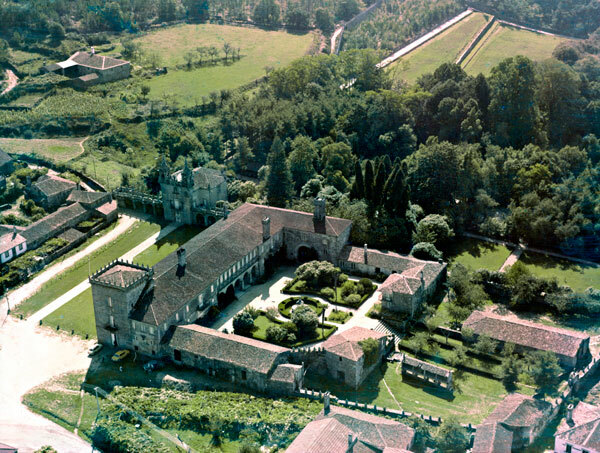 In 1929 part of the former stables enclosing the courtyard were demolished in order to connect it with the threshing floor via a staircase and open up a new vista towards the Valley of Ulla. 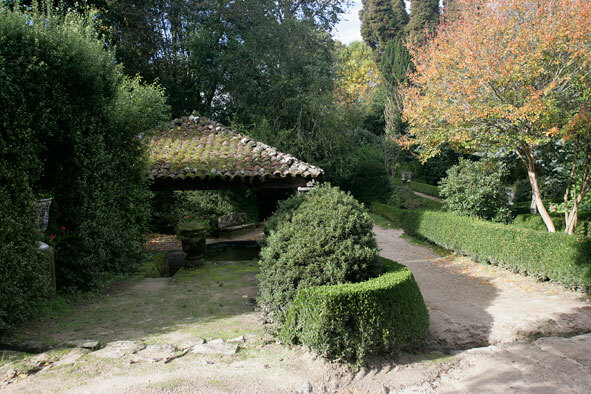 Prominent features of this area are: the granary, which is characteristic of the type found in the district of the Ulla; the magnificent octagonal carved stone drinking/washing trough; and, at the end of the path, the gateway decorated with the coats of arms of the Sotomayor, Moscoso, Parga and Mariñas families, which is known as that "of Cillobre" as it originates from a family property located in that village. The works carried out on this area, which are fairly well documented in the Medinaceli Ducal Archives (Oca section), began in the second decade of the seventeen hundreds and dragged on for at least fifteen years. 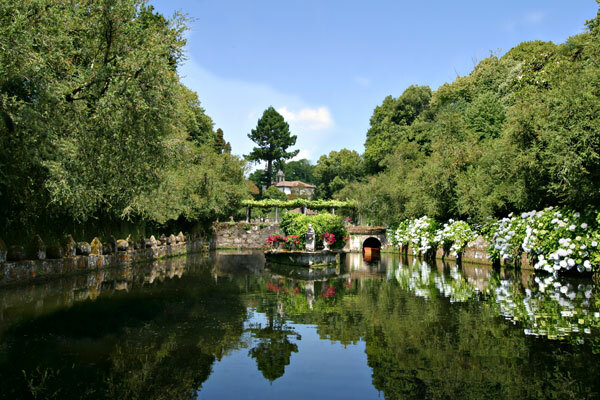 During this period the former lake of the old mill was replaced by two lakes with stone masonry separated by a bank and the water mill was moved from its original site (quite possibly the landing stage of the "lake of the vanities") to the top end of the lake of the virtues. The box plantations surrounding the lakes must date at least from this period, which makes them at least three hundred years old. The series of works described, which continued without interruption, the next starting no sooner was the previous one complete, indicates a preconceived plan. What is more, the concern conveyed by the works contracts over the symbolic representations of the stone figures--"well shaped and carved stones of artillery [...] about to shoot"; "two lions [...] their blazons projecting"--and over the effects of the water when falling ("whose water is to spout from the mouth of the said serpent [...] must fall into a round five-palm basin") unmistakeably denote the intention to develop a very precise message. 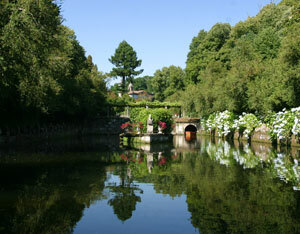 The most striking aspect of Oca is the masterful conveyance of water as both a playful and a productive element. 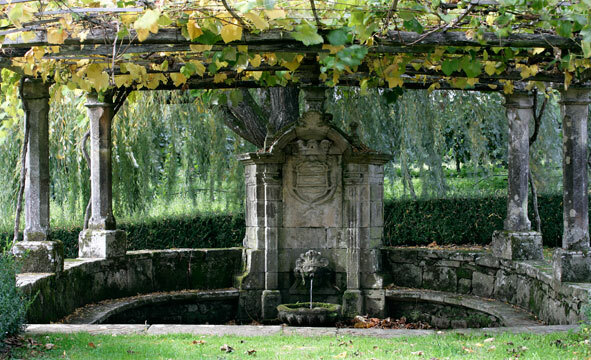 Notable among the existing fountains for their architecture are: the fountain of the Monkey (a), named after the heraldic beast that adorns it; the fountain of the Trout (b), a Baroque piece with neoclassical elements built in 1776; and the fountain of the Monument (c), which was commissioned by the Count of Amarante in 1733 from the same mason who crafted the boats for the lakes. 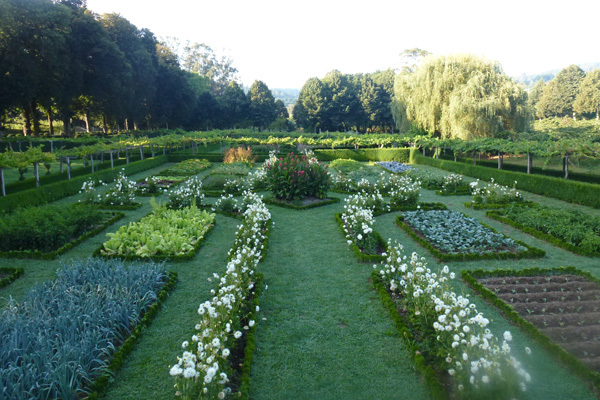 Oca still preserves the dual nature of ornamental garden and productive orchard with which it was designed as an embodiment of the 18th-century ideal of perfect harmony been utility and beauty. That is why conservation efforts place special emphasis on ensuring that commercial plantations such as kiwis and vines and historical collections of apple trees and a geometrically laid out orchard grow alongside botanically valuable species or ornamental plantations such as a collection of camelias. 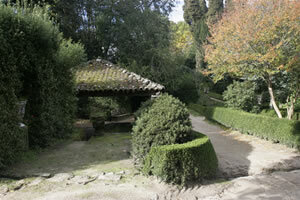 This very important axis of the garden is relatively recent. 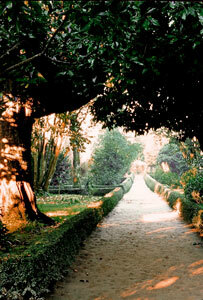 It may date from the new landscape features that François de Vié, gardner of the Royal Palace, was commissioned by the Marquis and Marquise of Camarasa to introduce around 1866. 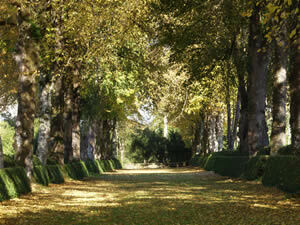 With an aligned plantation of lime trees enclosed by box hedges adorned with half-spheres, this French garden designer emphasised an existing path that connected the lakes with the Guillufe wood, in accordance with the landscape design trend of enhacing the integration of the garden into the surrounding nature setting. 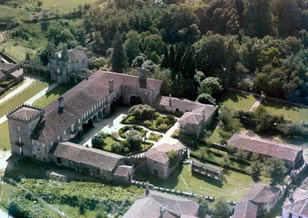 In the last third of the 19th century the garden was affected by the landscape alterations introduced by François de Vié. This is one of the few areas that were not subsequently altered by Ignacio Fernández de Henestrosa, Marquis of Camarasa, around 1930. 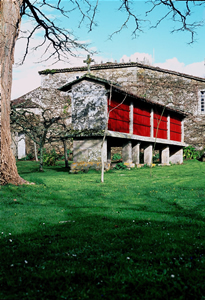 In one of its corners is a late 18th-century washing trough covered by a four-sloped wooden roof resting on chamfered shafts. 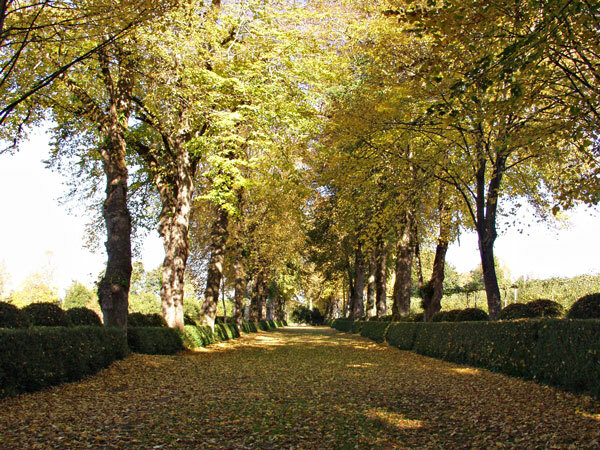 These gardens, which extend across the walled enclosure from east to west, in a strip some thirty metres long adjoining the facade of the palace, provide a transition between the more enclosed courtyard area and the open spaces of the gardens and orchards. 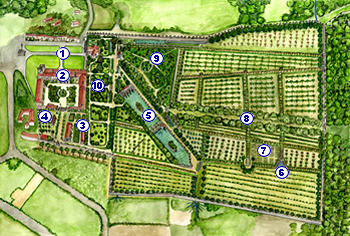 They feature in the earliest surviving plans of the garden, divided--both then as they are now--into large squares bordered by low box hedges containing the plant species of greatest botanical interest on account of their age: Camelia Reticulata, Cryptomeria japonica and European yew, among others.